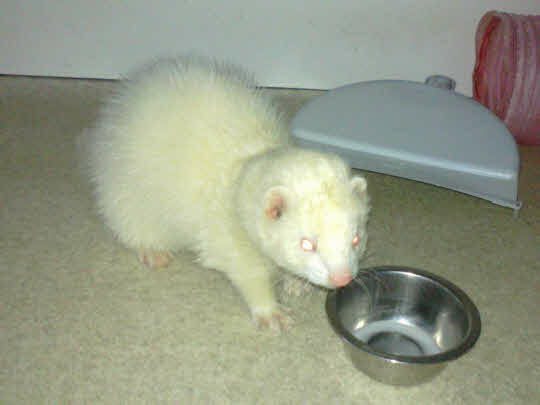 During the summer of 2016 I received a telephone from my local veterinary clinic call saying a small white stray ferret had been brought in and my advice was being sought. I discovered the ferret to be a male and obviously very tame and popular with veterinary nurses. He was in good shape generally other than a tick on the back of his neck, plus a few fleas and his fur coat being somewhat grubby and matted through being lost. He was a little shy when I first got him, but subsequently has become outgoing and very playful. He has put on a lot of weight and has a beautiful soft white coat. Alfie suffered recurring problems with his balance. Eventually it was found that he was suffering heart failure. He was placed on medication which improved his situation temporarily, but eventually his condition deteriorated such, that he was put to sleep on the 7th January 2018.